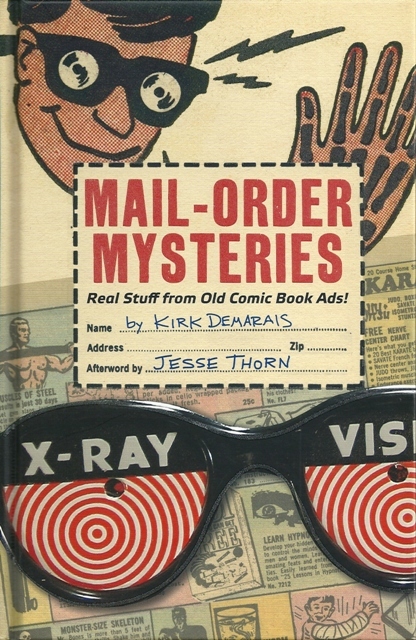 Recently, while browsing through Amazon.com, looking for something to use one of my gift cards on, I came across an interesting book called “Mail-Order Mysteries: Real Stuff from Old Comic Book Ads!” by Kirk Demarais. Growing up in the 70’s I was addicted to comics, especially those put out by Marvel, and the colorful ads advertising the coolest stuff ever; a part of my childhood that I will never forget. When I saw this book on Amazon it was a no-brainer…I had to have it! I immediately ordered it (and you can order it HERE) and was not disappointed when it arrived a few days later! Though it is not a huge book (only 156 pages) it really packs in the information and entertainment. 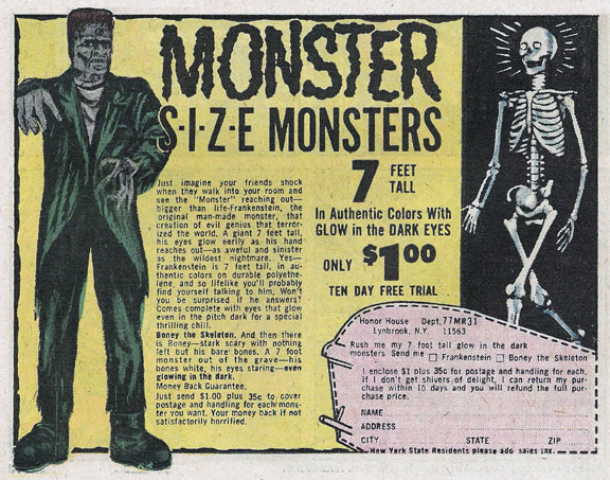 I vividly remember asking my mom if I could order the haunted house bank or the 7-foot monster, with the intent of scaring my little brother. She knew though…this stuff was mostly junk and not worth the $1 they were charging (plus 35 cents shipping). 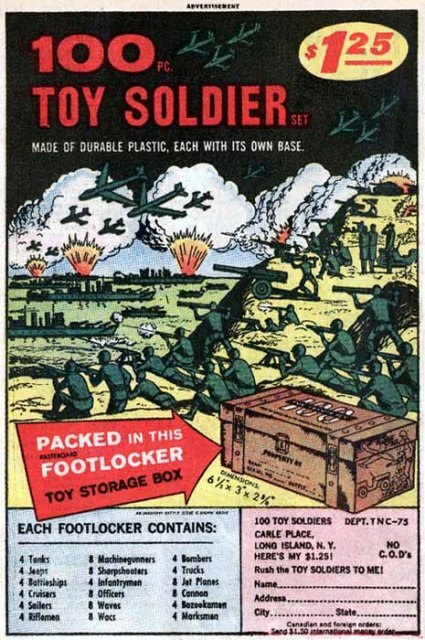 My mom eventually let my brother and I order the 100 piece toy soldier set shipped in its own footlocker! Of course in small print was the word “pasteboard” footlocker, something barely strong enough to ship anything in. Needless to say, 6-8 weeks later, when our armies arrived, they were mostly broken. And those that weren’t looked horrible! Instead of the three-dimensional army men we were used to buying in the local drug store, what we received were figures you could only look at from the side as they were as thin as the base! 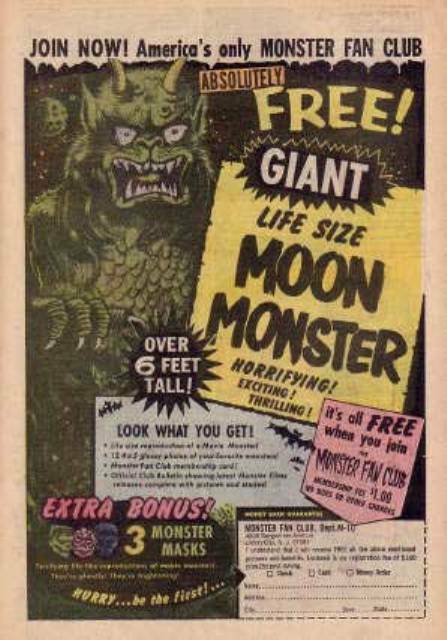 As a comic collector I started buying back-issues from the 60’s and the ads from back then were just as fun, but featured items us kids of the 70’s no longer had access to! 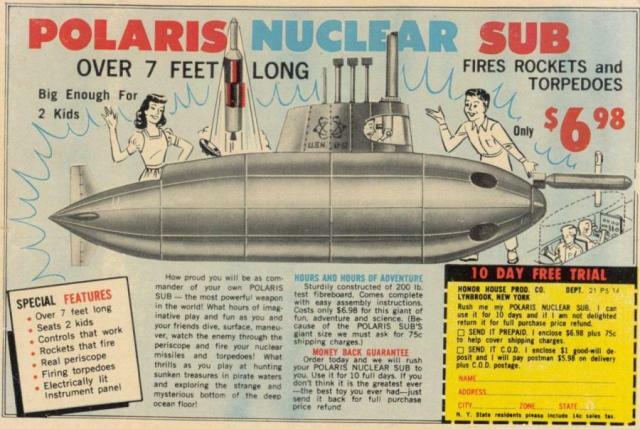 Back then you could order pet raccoons…monkeys…and these cool submarines, tanks and rocket ships big enough to fit you and one of your friends! These featured electronically lit control panels, firing missiles and everything you would need for hours of imaginative play! And get this…they only cost $6.98 (plus 75 cents shipping). 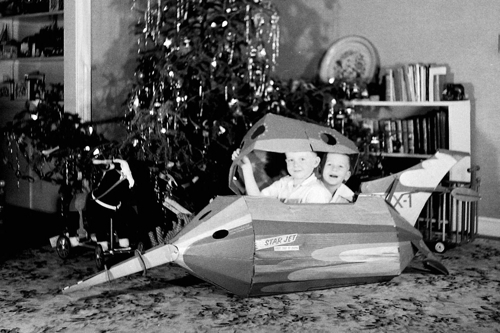 Of course they were just made of fibreboard but in my opinion, even though I never had the pleasure of owning one, I bet they were still fun! The actual “Jet Rocket Space Ship”! I cannot recommend this book enough! What it does beautifully is recapture the innocence of our youth, an innocence that I believe is lost on children growing up today. 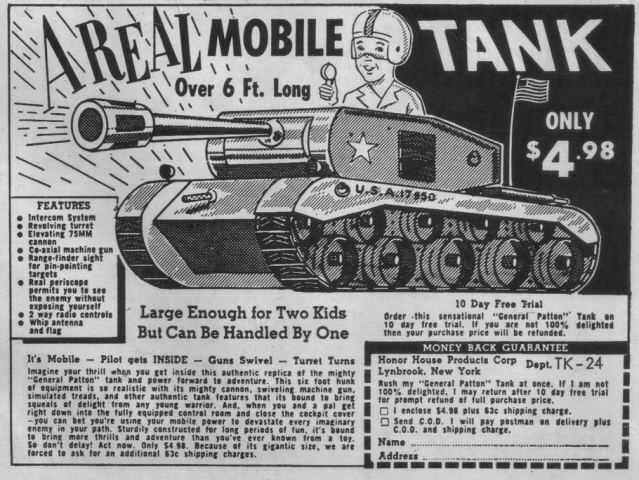 Each item covered features the original ad for the item, a brief description of what a child may think the ad was saying and then a picture of what you would actually receive. Granted a lot of the actual items received fell far short of what we thought was being advertised, but wasn’t it a great feeling back then to think you could buy an eye creature that you could actually control? 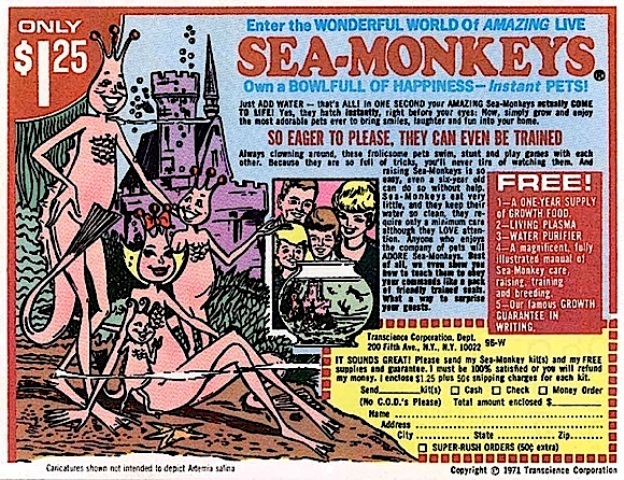 Or Sea-Monkeys that actually looked like little amphibious people? Times have changed, and not always for the better. 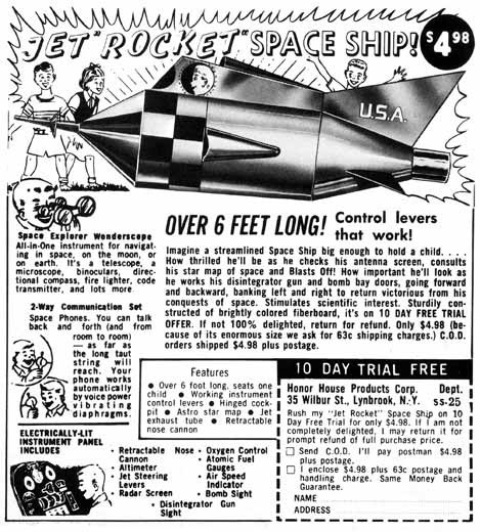 Gone are Saturday morning cartoons and gone are the awesome ads that used to appear in comic books. At least we do have this book to fall back on and to help relive a time that no longer exists. All I know is that I eagerly await a volume two! This entry was posted in Vintage Toys! and tagged ads, comic book, comicbook, Demarais, Kirk Demaris, Mail Order Mysteries, sea monkeys. Bookmark the permalink. ← Dinosaurs Run Amok in Chicago! I had, the Sea Monkey, X-Ray glasses, and the 100 piece soldier set. Those were the days of my uth. I think those crazy things highlighted a lot of our younger years. Thanks for the comment!